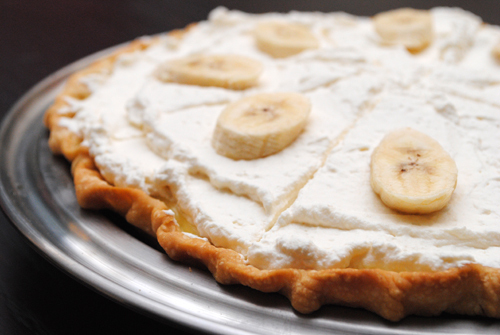 In the past year we made four Banana Cream Pies. The recipe was perfected by the second attempt, but the photos were the challenge. I am finally happy with our photos, both the single slice and the entire pie – which one is used in the book will depend on page layouts. Preheat oven to 450 degrees-F. Spray a 9-inch metal pie pan with cooking spray. Roll pie crust, place in prepared pie pan, and crimp edges. Pierce pie crust 20 to 30 times with a fork. Place pie weights or dry beans in the pie to prevent the crust from contracting. Bake for 10 minutes. Remove pie weights from the pan and cover edges with aluminum foil to allow the bottom to brown without burning the edges. Return to the oven and cook for an additional 5 minutes. Remove from oven and let cool to room temperature. In a mixing bowl, combine sugar, flour, and salt, and set aside. Scald the milk in a large saucepan over high heat. Reduce heat to medium and slowly add the sugar and flour mixture into the scalded milk. Continue stirring until mixture is thickened. Cover and cook for 2 minutes. While mixture cooks, beat egg yolks in a small mixing bowl. Add a few tablespoons of the hot mixture into the egg yolks and stir to temper the eggs. Pour egg mixture into the saucepan and stir. Cook for an additional minute, then remove from heat. Stir in butter and vanilla extract and set aside to cool until warm. 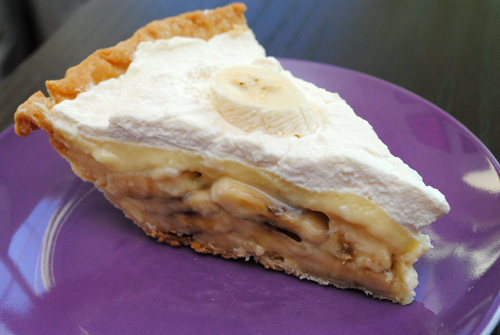 Slice 4 bananas, retaining the last banana for decorating the completed pie. When custard is lukewarm, add slices to the mixture. Stir to coat slices with custard. Pour mixture into the baked pie crust. Cover pie with plastic wrap and chill in the refrigerator for at least 2 hours, or overnight. When pie is chilled, remove plastic wrap and top with Whipped Cream. Return pie to refrigerator until ready to serve. Slice the last banana and place slices on top of the pie. Slice pie and serve cold.